From February to April, we tend to see quality issues on certain varieties of oysters. It’s something that happens each year, so we put together this FAQ to help address your winter concerns. What are oysters doing during winter? When we’re asked to think of animals that hibernate, bears, bats and other small mammals usually come to mind. But did you know, oysters also “hibernate” during the winter? Contrary to children’s books and fairy tales, animals in hibernation are not sleeping. Hibernation is a form of dormancy in which animals conserve energy to survive harsh environmental conditions. Oysters go dormant during winter because water temperatures can stay below freezing for months. Evolution has also taught them that there is no food in the water when everything is iced over. How do oysters survive their winter dormancy? To prepare for winter dormancy, oysters feed like crazy during the fall to build up glycogen, their sugar stores — which is why they are so sweet in autumn. When the water temperatures drop to 40° F, it signals the oyster to stop metabolizing and go dormant. The oyster will barely pump during this time and survive on its glycogen to get through the winter. When the waters warm up and food is back in the water, the oysters will become active again and start feeding. They will pump, filter, and eat from spring to fall until water temperatures drop again, triggering another cycle of dormancy. Inevitably, there are oysters that will die during winter dormancy. This phenomenon is called winter kill. Oysters run out of glycogen to stay alive or they are too weak to withstand the harsh conditions. The worst part is, some of these oysters die remaining shut. This makes them difficult to detect even when harvesters go through them by hand. What are some signs of winter kill? Because some oysters die shut, they cannot be detected until they are shaken up or shucked open to reveal dry, shriveled, smelly meats. Dormant oysters are weaker and have difficulty healing themselves, so any chipping during harvest, culling, packing, or transit can lead to liquor loss. Why does winter kill affect certain varieties more than others? If you are a Pangea Shellfish customer, you will notice that certain oyster varieties are unavailable from March to May like wild-harvested Malpeques. These are the months when winter kill is most apparent, and Canadian supply is a great example. Canadian waters get colder earlier in the year than locations down south. This also means the oysters enter dormancy earlier than its southern brethren. If a Canadian oyster enters dormancy in early November, it may not start feeding again until May when waters warm. It basically needs to survive on its glycogen that whole time! It’s impossible to ask the oysters to be in tip-top shape from March through May when they have not eaten for six to seven months. 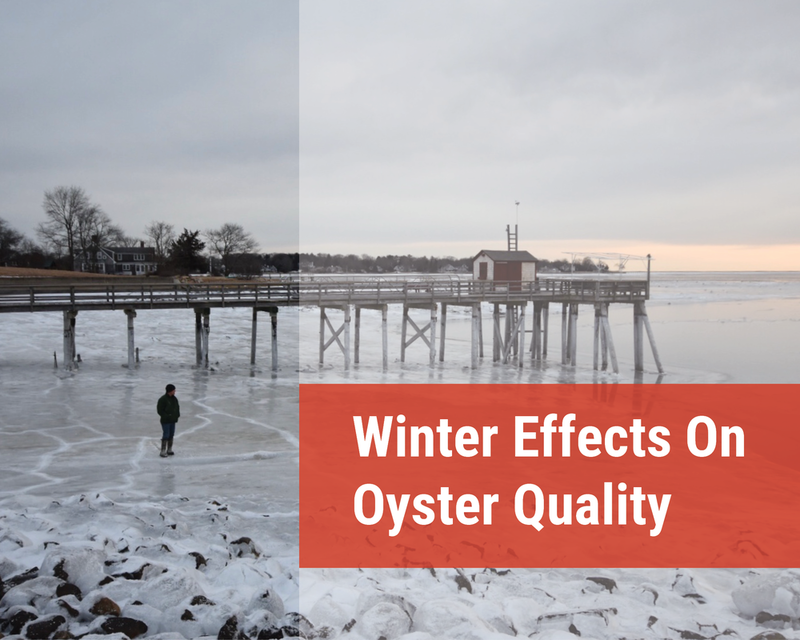 You will also see signs of winter kill in New England oysters as we approach March, but it’s not as noticeable because their dormancy period is shorter. New England oysters are likely feeding until the end of November and start feeding again in late March. They have to survive about four months compared to the six months Canadian oysters endure. Which varieties are less susceptible to winter kill? Winter kill is less of an issue for southern varieties because of warmer water conditions, but generally, farmed oysters have a better chance of survival than wild oysters. Growers make sure their oysters have the best access to food throughout the year and condition them to have stronger abductor muscles. Farms also have different wintering and culling methods to tackle winter kill and limit its effects on product quality. So, despite Canadian oysters being more susceptible, many of the cultured Canadian varieties look nice throughout the season. When the oysters finally start pumping and feeding again, it will take a couple of weeks for their quality to improve as they replenish themselves. Timing will vary by area because water temperatures differ by location, but we will see most varieties in better shape by late May. Is there anything I can do to limit the effects of winter kill? Yes! Be gentle. The oysters are weak, so any tough handling will result in dry or dead oysters. Give them extra attention and protection, especially in transit. If you encounter a smelly bag, make sure to go through the bag or box because it could just be one dead oyster responsible for the smell. Discard the dead and rinse the rest. The remaining live oysters are just fine! If there are any issues, contact your supplier. Dead oysters can go unnoticed until shucked, so giving your supplier feedback can help them assess the situation. Duxbury Bay, January 2019, Mike Cesarini. Special thanks to our Canadian producers for contributing to this piece. Have a winter quality question not listed here? Ask it in the comments section below.